Rooms from $65.39 per night. Description This Douglasville, Georgia hotel has free internet access. This hotel is also pet friendly. Free hot breakfast in-room microwaves/refrigerators and complimentary Wi-Fi GÇö all in a location near the interstate GÇö are just some of the amenities that have our guests giving high rankings to the Super 8 Douglasville. 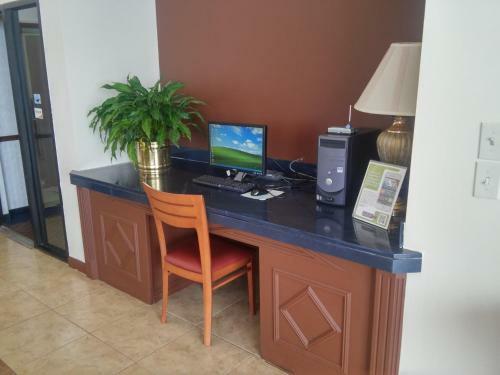 The two-story hotel has 51 rooms some non-smoking that all come with free Wi-Fi cable TV refrigerators and microwaves. Breakfast is on the house every morning. For relaxation feel free to visit the hotel's hot tub. There's also a laundry facility on site. Parking is free with ample space for trucks. The hotel is off I-20 three miles from Arbor Place Mall. It's less than eight miles from Six Flags Over Georgia Theme Park and 30 miles from Six Flags White Water Theme Park. The Georgia Aquarium and Underground Atlanta are 21 miles away. Hartsfield-Jackson Atlanta International Airport is also 21 miles from the hotel. Add Baymont Inn And Suites Douglasville Atlanta to your free online travel itinerary.